How Does $7,300 for a 2012 Turbo Chevy Sonic Sound? You might not remember all the little cars Chevy sells, but with a six-speed and spritely turbo mill today’s Nice Price or Crack Pipe Sonic might be the one to know. That is, unless its price makes it eminently forgettable. While not generally a fan of controversy, I do garner enjoyment out of the odd dissimilitude that often arises between the comments here and the votes. A disparity of this nature occurred yesterday in assessment of the day’s candidate, a 1991 BMW 535i for which was asked $1,800. Many in the comments claimed that any running car under two-grand was automatically a good deal. Others added that the fact that it was a classy Bimmer, and a stick to boot, was just icing on the gravy. That’s why I find the car’s meager 68 percent Nice Price win so intriguing. I guess that’s what makes the world such a funny place. So, a quick show of hands—who here remembers Daewoo? Just a couple of you? I thought as much. I’ll bet the same fate has befallen the Korean company’s final model, the Kalos, which here in America was marketed as the milquetoastian Chevrolet Aveo. It’s understandable if you’ve also not committed that compact to your long term memory, especially since doing so would have inevitably pushed out some other characterless small car like the Ford Aspire. You might however, want to keep tabs on the Aveo’s successor, the Sonic. The justification for doing so is that the Sonic can be had with a small but mighty turbo four, and a six speed stick. You can add to that a suspension tuned by Chevy’s Lead Development Engineer, John M. Buttermore, who at the time was also the SCCA Touring 1 National Champion. Good bonafides all around. 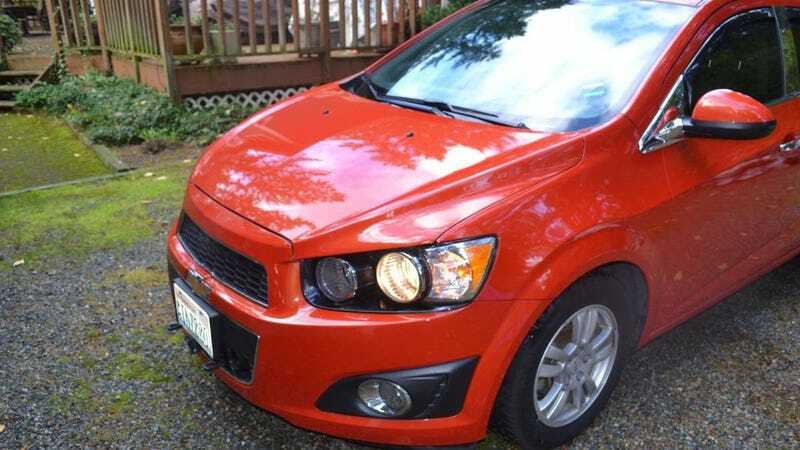 This 2012 Chevy Sonic LT is a mid-level model and as such comes with a few gee-gaws in addition to its 138 horsepower 1.4 turbo four and long-geared six speed stick. It doesn’t however, have much in the way of luxury accoutrements from the factory. An attempt has been made by way of the aftermarket to address that shortcoming. More on that in a bit. The Sonic’s styling is appreciably aggressive and concise. It’s been said that small cars are the hardest to style, owing to their more limited canvas. The Sonic, while diminutive in the extreme pulls together its bits and pieces in a reasonably pleasing way. It also doesn’t seem to have worn out its welcome here a few years down the road, even if the back end does look eerily like a munchkin-esque Mercedes R-Class. That’s perhaps the only way you might confuse the Sonic with the upscale German brand, although someone has tried to fancy-pants the car. What’s been added is chrome wrapped around the window trim, as well as some plastic wood on the dash and doors inside. Speaking of the dash, its design is intended to remind you of that of a motorcycle with a center-mounted analog tach, and a big blue speedo to the right. Hopefully missing from the two-wheeler theme is the numb nuts you can get from a long day in the saddle. The seats don’t look either particularly comfortable or torturous, but are cloth covered, which is nice. There amazingly are five of them, and everything looks to be in fine shape. If ultimate space is your ultimate goal, then the Sonic shouldn’t be your choice. Go get a Honda Fit instead. If you want something that puts a little more rocket in your pocket however, then the Sonic may just fit the bill. The exterior, in Inferno Orange Metallic, is said by the seller to be in perfect shape, with no dings, dents of chips in the paint. It’s also claimed that the passenger seat is rarely used, the back seat even less. That’s resulted in car that presents almost as new. It comes with 67,000 miles on the clock and two sets of wheels/tires for those of you who live in snowy settings. It also comes with a clean title and is raring to go even though its seller has garaged it in preference of a recently acquired Mercedes sedan. The Sonic is an under-appreciated ride. A hot hatch of modest but laudable capabilities, it can evoke memories of the original VW GTi when driven. The clutch and shifter are not among the best, but steering and suspension make up for that and it can be a cheap way to have fun. How cheap? Well, this one, with its chrome and wood trims, asks $7,300—not a pittance, but not new-car range either. The question for you is: could this little Chevy hot hatch be worth that? Is this really a hidden gem on the used car market? Or, is it just another Aveo? At $1,800, Would You Side With This Mega-Mileage 1991 BMW 535i? At $7,600, Could This T-Roofed 1982 Datsun 280ZX be the Tops? At $2,700, Could You See Yourself Buying This 1994 Eagle Vision TSi?